Buying a new residential park home? Today we had the pleasure of meeting a lovely couple Mr Alan and Ms Julie. These two fabulous people met last year and have been together ever since. They realized they wanted to have a new beginning and spend their life together and see what options they had in terms of residential parks to help with that dream. Let us tell you this- We haven’t seen a couple who are so perfect for each other!! At present, they live on a seventh-floor apartment in Barnet in London and now want a ground-floor bungalow-style living with their own garden. The journey of thinking about moving to a park home started about 6 months ago for them. Alan’s wife passed away last year and Julie had been going through a divorce. They realized that they had to let go of past sorrows and start on a happy journey together. They always knew that they had to be in Surrey as they absolutely love the area and also because Julie’s parents live in Guildford, It’s important for her to be near them. So they started to evaluate various options. They met with some friends who had moved out of London to see what lifestyles they were enjoying. Alan and Julie ultimately decided that a residential park would be a good option for them. The picture of being in a traditional English community in a beautiful green setting and set their hearts to make their dream a reality. Alan says “Some of our close friends questioned our decision to opt for a park home- they had ideas of grubby rows of houses stuffed in next to each other in sort of Campsites”. That view changed very quickly once they visited the Fangrove residential park. Spaced –out beautiful homes with lovely gardens was what greeted them. An added bonus was the quaint community club situated right in the middle of the development, run by the residents. It boasts of organising mini-bus trips, Monday – night Bingo events and many other activities! It’s got a well-stocked bar, huge indoor space for events, a pool table and a lovely outdoor seating area as well. “So you get your privacy but there is an added bonus of being a part of a community too!” says Julie. So how did he go about ticking all these conditions off with Wyldecrest parks? Let’s start with the first two– AREA and LOCATION. Alan and Julie always knew it would be Surrey and they shortlisted a few parks around Surrey. 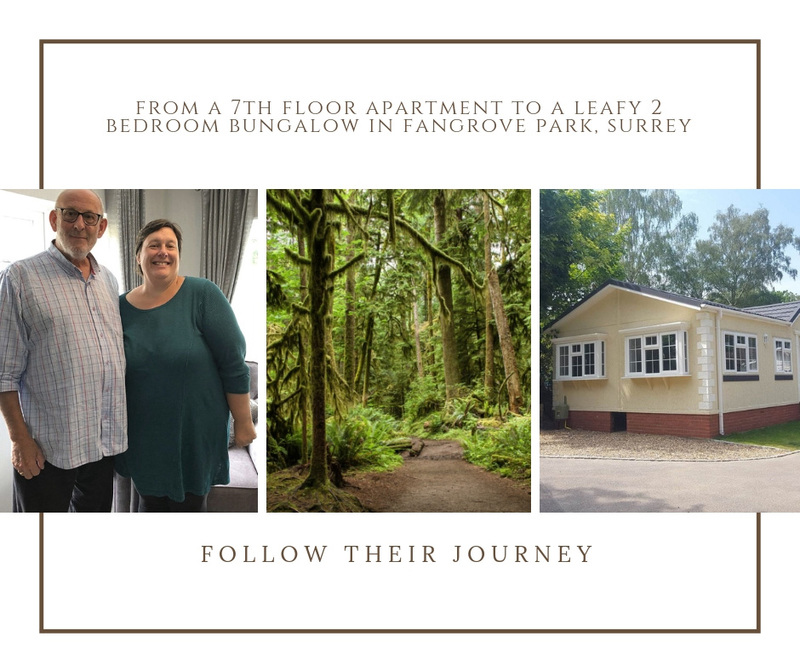 They then visited these parks one-by-one over the course of a few months, but in their own words as soon as they visited Fangrove Park they fell in love with it. What made them so happy about the park was its beautiful setting. The houses are spaced apart and not cluttered around. Plus ‘it’s so green and with beautiful trees all around” says Alan. Fangrove park is located in Lyne, Chertsey, Surrey KT16 0BN. It boasts of magnificent views, lovely nature trails and has farm shops and artisan shops around. So it’s easy to understand why Alan and Julie love the area! So getting back to Alan’s all important list. Item number 3 is the plot, but we will come back to it in a bit. In the natural progression, the next thing they wanted to be sure about was their actual house. When they visited the park, they saw the show home, a traditional luxury 2-bedroom bungalow. Since they were moving from a modern London apartment, they were not sure of the traditional style of the bungalow. Also, they were happy to realize that they can pick and choose each and every item in their new home- from the carpets to the worktops- they get a huge choice from which to select. So that was a big yes on their point number 4. Item number 5- the price. That’s a big one – so let’s dive in. Alan already has an apartment in London which he wants to sell to buy this lovely park home and also have some money left over to put into the bank. Sound like a brilliant idea but would it work? Well, it just did. He used the Part-exchange scheme, which meant he passed on the stress of selling his home (at market value) to us at Wyldecrest Parks. We will now make sure we sell his house; he doesn’t need to worry about any Solicitor fees, estate agent fees and even get free removal??? so he gets to sell his house with no headache! We take care of most of it. Item 5 was suddenly a non-item now!! And finally to take care of the final item -item no. 3 that we had skipped earlier, we met up with the excited couple at Fangrove Park, their third happy visit by the way. Now that they had chosen their home, they wanted to envision where it would be situated as they didn’t want it too close to other houses, have a view of the lovely greenery around get enough light and be the right size! Whew! Guess what – the plot which they were offered put a giant check mark against all these conditions and more. So now at the time of writing this, they have signed up for their new beginning and put their deposit down to secure their dream home in their chosen location. The next step is their home specification appointment in 2 weeks’ time, where they will decide on each and every item which goes into their new home. They are looking to move in the spring of 2019 so they do have enough time to plan, ponder and decide everything in peace and in detail. Well, we hope you enjoyed being part of Alan and Julie’s journey of finding a retirement park home. We at Wyldecrest are lucky to meet and be able to help all the beautiful people who are setting out on their new adventure in life and who are seeking to find their own slice of heaven on earth! Do keep checking back to read about the next phase and when they finally move into their new dream home. If you have any questions for Alan and Julie, please feel free to comment and I am sure they will be happy to share their thoughts with you. At Wyldecrest, we are proud of serving the community and take pride in managing more than 70 Residential parks spread across England. Next UK’s housing crisis: are mobile home parks an answer?